For years I was intrigued by the idea of making my own oil candles at home. 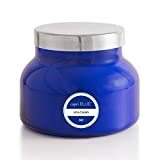 Candles that burn canola, olive, or other vegetable oil as fuel can be used for special occasions as well as for emergency use during power failures. Of particular interest to me was creating an oil menorah for Hanukkah. The oil from the Hanukkah story is olive oil, and I thought it would be particularly meaningful to create a menorah that used olive oil for fuel. 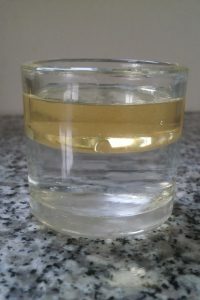 There are several different models of oil candles that can be made at home. 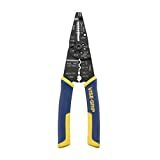 The one I use is appealing for its simplicity and safety. With just a few supplies, a candle can be produced in just a couple of minutes. 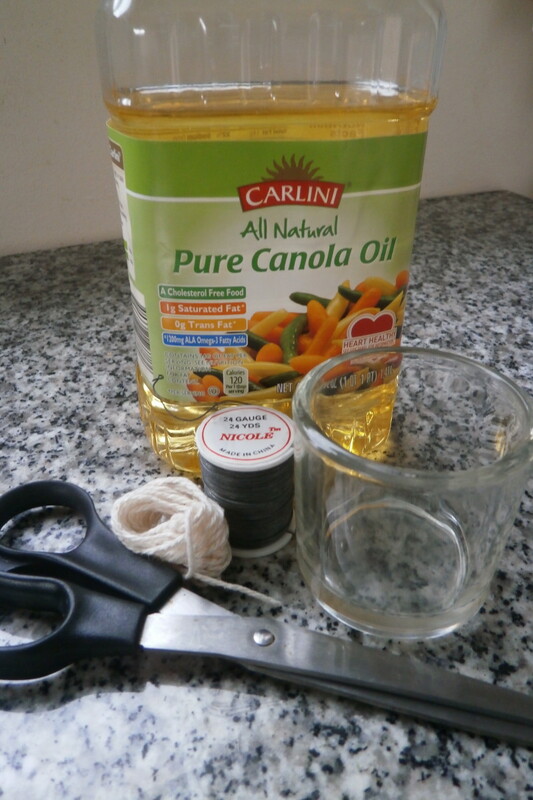 You need only a few household supplies to make an oil candle. *The string used as a wick must be 100% cotton so that it burns correctly and safely. On the right are pictures illustrating the process; click on the thumbnail to see the picture enlarged. 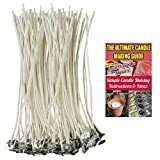 Further down there is a description for using a pre-made candle wick instead of string and wire. 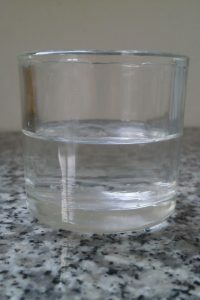 Fill the glass container partway with water. The more water used, the less room there will be for oil. If you want a candle that lasts longer, use less water and more oil. But even with just a thin layer of oil, the candle will burn for quite a while. 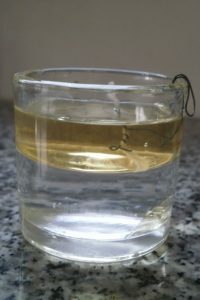 After placing water in the container, fill the container with oil until it is fairly full but with some room left below the rim. Regular household olive oil, canola oil, or other vegetable oil works just fine for candles. 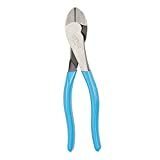 *Cut the cotton string and the wire so that there are a few inches of each. 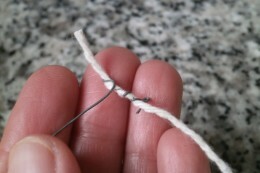 Wrap one end of the wire a few times around one end of the cotton string, which will be used as the wick. 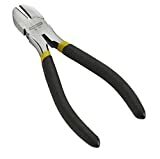 There should be a small tail of string sticking out beyond the end of the wire. This is the part of the string that will be lit. 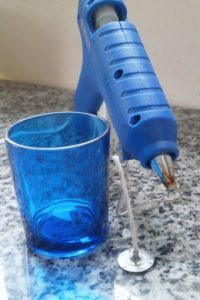 Bending the wire in whatever way is required, loop the other end of the wire over the lip of the glass container. 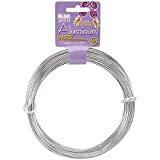 The wire should make a kind of “S” curve so that it bends over the edge of the container and bends again to keep the end of the wick about 1/4-inch above the top of the oil. Allow the wick to soak up some oil before lighting it. If it doesn’t light easily, you can pour a little oil on top of the wick. *Arranging the wick can be done first, so that the wick is already in place when you add the water and oil to the container. Note: If the flame is burning particularly high, the wick is probably too long. Either cut the wick or adjust the wire so that the wick doesn’t stick out so far. 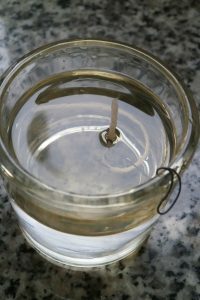 Conversely, if the candle flame is too low, work with the wire and the wick so that more of the wick is exposed above the oil. 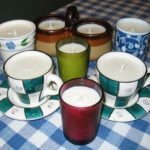 You may also be interested in my article Make Your Own Candles in 9 Easy Steps. 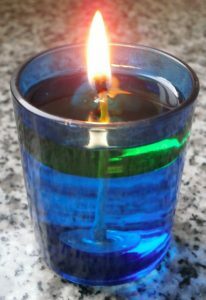 This article provides detailed instructions to make nontoxic container candles for yourself or to give as gifts. Making candles at home is much less expensive than purchasing them at the store. 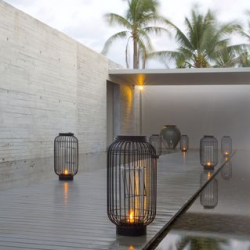 Lighting your own candles adds to the ambiance of any occasion! 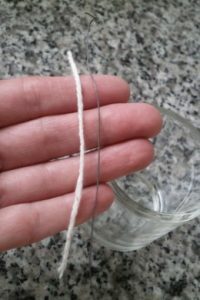 Instead of wrapping wire around a cotton string to create a wick, you can use pre-made wicks for your oil candles. 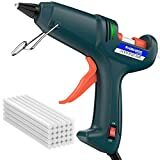 The pre-made wicks are convenient, and they are secured to the bottom of the container using a few drops of hot glue from a glue gun. This is a good option if you plan to re-use the container as a candle holder. 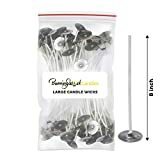 If you prefer to have the container available for other purposes when it’s not being used as a candle, you’ll want to use the string-and-wire method, since that style of wick is not permanently attached. Planning on using the same candle again later? Try covering the candle with aluminum foil to prevent dust and other contaminants from settling in the candle. Or use containers that have screw-on lids to keep the fuel clean AND prevent the oil and water from spilling out! The Jewish holiday of Hanukkah is observed by lighting a nine-branched candelabrum called a menorah. One candle is lit for each night of the holiday, so that one candle is lit on the first night, two on the second, and so forth until the eighth night. The ninth candle is called the shamash and is used to light the other eight candles. Celebrating Hanukkah with an oil menorah, particularly one that uses olive oil as the fuel, is a beautiful way to commemorate the Hanukkah story. Legend has it that when the Jewish freedom fighters recaptured their holy Temple from the Syrian Greeks in the year 165 BCE (Before Common Era), there was only enough oil to light the Temple’s eternal flame for a single day. The miracle of the Hanukkah story is that the oil lasted for eight days, providing sufficient time for more oil to be prepared for use in the eternal lamp. The oil they used was olive oil. Today, wax candle menorahs are much more commonly used than oil menorahs. Oil menorahs are sold, but making your own is certainly much less expensive than purchasing this specialty product. 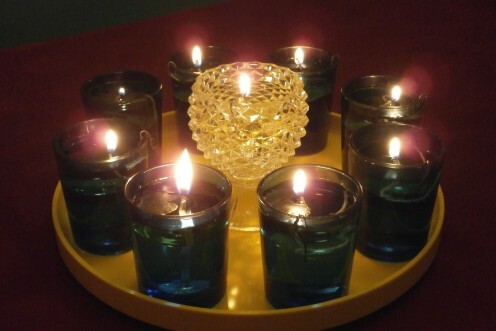 When using a wax candle menorah, the shamash candle is lit first. That candle is then used to light the remaining candles. This method is not possible with oil candles, as you can’t pick up one oil candle to light another. Instead, the shamash candle is lit and then another object is used to transfer the flame from the shamash to the other candles. 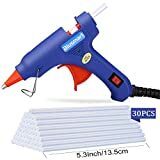 This can be a wax Hanukkah candle, a birthday or other candle, a pre-made candle wick, or any other material that can safely carry the flame. As with any candle, appropriate caution must be used with oil candles. Make sure that the flame is away from all other objects and that flammable materials are kept at a safe distance. 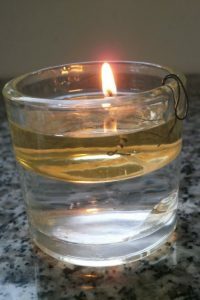 There are some homemade oil candles that are designed to have the wick thread through a hole in the container’s lid. I do not recommend these, as the heat from the candle can dangerously increase the pressure in the container. The first video on the right shows what can happen if too much heat and pressure build up in the container. “Open” candles without lids do not pose this danger. If the candles spill, they will make a bit of a mess and you’ll have to clean up oil and water. However, if the candles are tipped over, the flames will go out immediately, posing no danger of igniting material as the result of a spill, as you can see in the second video on the right.